This is a very interesting and truly international competition, which has gone from strength to strength since I attended the Luxembourg Society for Contemporary Music's prize concert given during the ISCM World Music Days at Luxembourg. The present CD is the fruit of 134 anonymous submissions of scores from composers of any age from 37 countries: Argentina, Austria, Belgium, Bolivia, Brazil, Bulgaria, Canada, Chile, China, Denmark, Estonia, Finland, France, Germany, Great Britain, Georgia, Greece, Hungary, Ireland, Italy, Japan, Korea, Luxembourg, Mexico, Moldavia, the Netherlands, New Zealand, Philippines, Poland, Portugal, Romania, Russia, Slovakia, Spain, Ukraine, Uruguay, USA and the judges must have had a hard task. Five works were chosen and recorded live in May 2004, and I have found all of them rewarding to listen to, twice each. Invidious to choose, but I would say the jury got it about right. 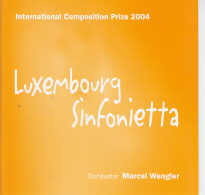 So did the audience which opted for the Chinese composer Lin Wang for her sparkling piece, which took full advantage of the unusual composition of the Luxembourg Sinfonietta, an unusual ensemble with clarinet, clarinet bass, alto saxophone, tenor saxophone, baritone saxophone, horn, 2 trumpets, tenor trombone, tuba, 2 violins, viola, violoncello, piano, mandolin, accordion, percussion. Preparation was clearly thorough and the recording is of demonstration class. From the accompanying notes it becomes clear that most of them have active international study and varied performance CVs, and they bring a poetic sensibility into choosing and mixing contemporary composing techniques. There is also a sense of joy and sheer pleasure in composing and in sound worlds which comes across, no sterile academicism. Chanaral ORTEGA-MIRANDA, the first prizewinner, is inspired by an Inca legend; Lin WANG's Lin lang means a piece of fine jade, and is dedicated to my parents far away from Saarland, where she had been studying. Satoru IKEDA dreamed his Fireworks, rather as Stravinsky had his Octet. The Italian Matteo FRANCESCHINI takes a melody through many moods, finishing with an ethereal marimba cadenza. Jonathan EATO is a man of many parts; he runs jazz provision at Exeter and refers to modern dance culture in his piece. P.S. 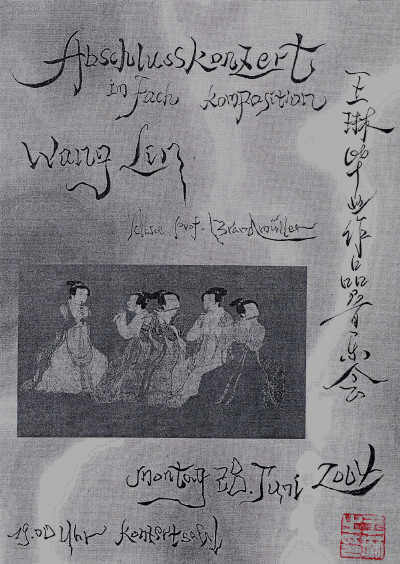 I have received from Lin Wang a recording of her June 2004 graduation concert at Saar University, which is vastly impressive and substantiates my strong belief that, whilst young composers are unavoidably represented in many festivals by single works, it is usually rewarding to try to hear more. This was an ambitious concert, superlatively well played, with pieces for large and smaller ensembles, and including works for piano and clarinet solo, and a duo for oboe and viola which would be well worth exploring by enterprising instrumentalists. Established now in Germany, Lin Wang's music is 'cross-over' with China at its best; another strand in the valuable initiative admired in Amsterdam with the fruitful cooperation between Chinese composers and the Nieuw Ensemble in Amsterdam.